89 year old Agnes Varda, one of the leading figures of cinema’s French New Wave, and acclaimed 33 year old French photographer and muralist, JR, are kindred spirits sharing a lifelong passion for images and how they are created, displayed and shared. Together they travel around the villages of France in JR’s photo truck meeting locals, learning their stories and producing epic-sized portraits of them. The photos are prominently displayed on houses, barns, storefronts and trains revealing the humanity in their subjects, and themselves. 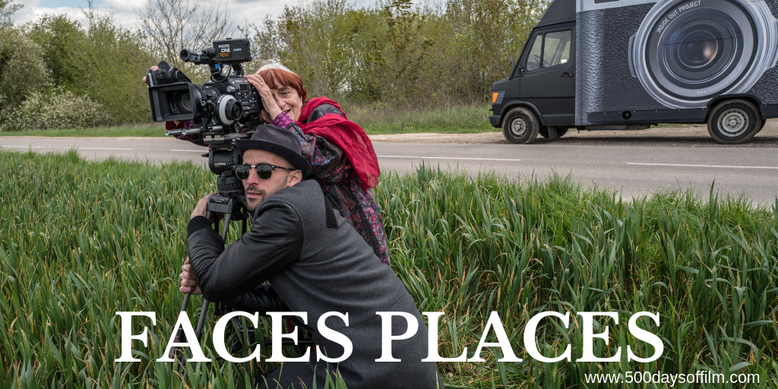 Faces Places documents these heartwarming encounters as well as the unlikely, tender friendship Varda and JR form along the way. On paper, Faces Places seems like a strange concept. An octogenarian filmmaker tootles around the French countryside with a photographer in his thirties in a van that looks like a camera. Occasionally - and seemingly without a plan - they stop and take pictures of the people they meet. The images are then plastered on walls, barns, water towers and the like. It shouldn’t work but, thanks to the endearing relationship between icon of cinema, Agnes Varda, and the remarkable artist and photographer, JR, it does - it really, really does. The unlikely pair have a truly special chemistry. It is wonderful to watch them talk about their art and, through these fascinating and endearing interactions (JR enjoys teasing Varda), we see the exuberant bravado of youth juxtaposed with the wisdom and poignancy of old age. Alongside their relationship, we meet a number of people living in a number of French villages. We hear their stories and understand how life has changed for them over the years. Then Varda and JR set to work - producing large black and white images that are later pasted onto various public surfaces. The impact is startling - both for us and for the subjects themselves. There is something deeply moving about these photographs. Perhaps it is their scale, perhaps their location. Perhaps the emotion comes from the stories. Whatever the reason, Faces Places reveals the power of art from the intimate and deeply personal to the way it can bring an entire community together. Agnes Varda and JR were introduced by Varda’s daughter, Rosalie (who produced Faces Places). JR made the first move and visited Varda. The next day Varda visited his studio. This was when she first realised that JR never removes his sunglasses (or does he?). Both knew immediately that they wanted to work together. After discussing the possibility of a short film, they settled on co-directing a feature length documentary. 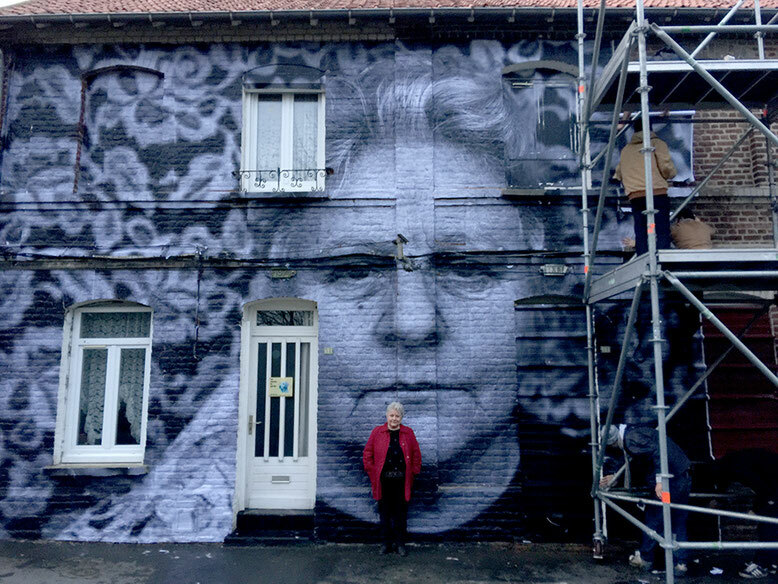 “It seemed clear that your [JR’s] habit of pasting big pictures of people up on walls, empowering them through size, and my habit of listening to them and spotlighting what they say, would lead to something,” Varda recalled in an interview with Olivier Pere in January 2017. Varda knew that JR predominantly worked in cities and so she persuaded him to consider a change in perspective - to visit villages in the French countryside. Much of their encounters happen by chance but some locations were chosen based on a personal experience or connection. Unsurprisingly given her age, Varda spends a lot of time in Faces Places observing people and locations and watching JR and his team construct the photos. However, this was very much a collaboration - many of the photographs used were Varda’s. Varda’s age did impact the production of Faces Places. No longer able to shoot eight weeks in a row, she would shoot two to four days a month. In the interview with Pere, JR explains that this schedule was a positive thing for the film, giving the co-directors time to reflect and to edit the documentary along the way. One of the interesting themes in Faces Places concerns sight. During the documentary we understand that Varda’s vision is failing and the impact of this is movingly woven into a film that constantly comes back to thinking about eyes and the gaze. Faces Places is a collage of stories, ideas and images. It shouldn’t work but it really, really does. This is a special documentary made all the more moving in light of Agnes Varda’s recent passing. She will be very much missed. Have you seen Faces Places? You can now watch it on Netflix. If you have, what did you think of this documentary? Let me know in the comments section below or over on Twitter. You can find me @500DaysOfFilm.